NexFirm, a law firm service provider, specializes in launching, managing and improving law firms across the country. Their clients typically double in size within the first year. Even more impressive is that, out of the dozens of law firms they’ve helped launch, none have gone out of business. But with success comes growing pains. NexFirm needed a solution that could scale, grow and evolve with their business. They needed a tool that integrated seamlessly with the back office solutions they offered their clients. A solution they could customize on a client-by-client basis. This created a new set of challenges. David DePietto, Founder and CEO of Nexfirm. NexFirm needed timekeeping and billing software to support their clients. Attorneys are understandably nervous about striking out on their own. NexFirm works with them to create a launch plan; a free, detailed and comprehensive study that outlines the details of launching a new law firm, and plots a path with the greatest chance of success. “We see the timekeeping and billing market as bifurcated: In one corner you have robust, long lived applications that were born as client-server applications that are very powerful and feature rich, but are not user friendly and require a great deal of training and user effort. It is difficult to get the timekeeping compliance that we believe is critical to success. NexFirm decided to transition all of their clients to Bill4Time. The NexFirm F&A team supports many different types of practices across the country, and on any given day touches every function and feature that Bill4time has to offer. Bill4Time has become a primary interface for communication institutional knowledge between NexFirm and its clients. Bill4Time is the enabler that allows the accurate and timely recording for critical practice information, and allows NexFirm to provide its clients with the accurate and timely financial information needed to make informed decisions that bring success. Recommendations backed by hard data. “During our monthly financial review call with our clients where we review their financial results from the previous month, and discuss the forecast for the upcoming month. This allows us to make suggestion, such as whether it is time to be hiring, firing, changing rates, taking different kinds of matters, expanding the office, engage in additional marketing or less of this or that.’ The availability of this information to make informed decisions is the key to the success record of our client base. Using the robust reporting, we train our clients to use Bill4Time for real time flash reports in between monthly reports so that they can understand how are we doing versus their budget and forecast. Any day you can go and say what did I bill today? What did I bill month to date? How much cash have we brought in? And that gives them the tools to see how they’re doing between checkpoints. Maximum results with minimal training. “Each year we assess the time keeping systems available in the market; one of the things that we measure training time for a new user. Because we train each of our clients, ease of use and training intensity is very important” David explains. Does this translate to a significant amount of value for NexFirm and their clients? “We set 15 minute training meetings for new users on Bill4Time. We set a 30 minute training meeting for owners/partners who have to do learn than just time keeping, such as report creation. They rely on Bill4Time to make that happen. A pain-free way to scale, grow and manage each of their client’s firms. Pain isn’t a requirement for growth. NexFirm understands the growth challenges facing law firms today. Your firm is expected to deliver more value with less resources. You’re pressured to offer AFAs, to customize the client experience. 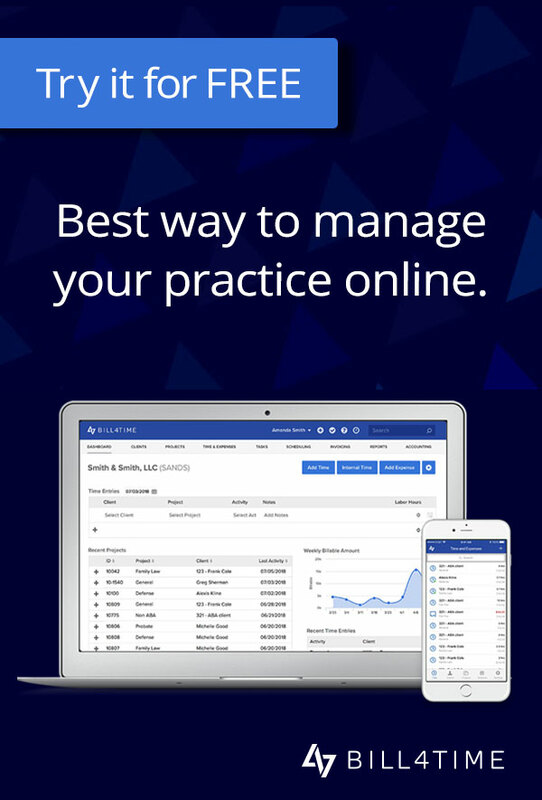 With these challenges comes opportunity, and with the right mix of tools, systems and procedures, you’ll have what you need to build and manage a successful law practice. To outperform your peers, one client at a time.